Today’s recipe is going to be super fast and easy, because that is just the kind of day it is! I made these fruit skewers a few weeks ago for a party and not only were they a hit, they came together quickly and looked beautiful on the serving table. A winner all the way around! You’ll need a watermelon, cantaloupe, skewer sticks, a melon baller and some grapes for garnish. Slice open the melons, scoop out the cantaloupe seeds and whip out your handy-dandy melon baller. I love mine. You can use it for making mini cookie scoops, for digging out pumpkin guts, for scooping slushy fruit drinks into glasses. Today, though, use it to make perfect little balls of sweet, juicy melon. As you make the balls, scoop them into a bowl. If your melons are less-than-perfection ripe, do this the night before you need them, sprinkle with sugar, stir and let rest overnight in the fridge. That sprinkling of sugar will give them a great flavor of they need a bit of help. Once you’ve got the melon balls all scooped, start threading them on skewers, alternating a watermelon ball with a cantaloupe ball. 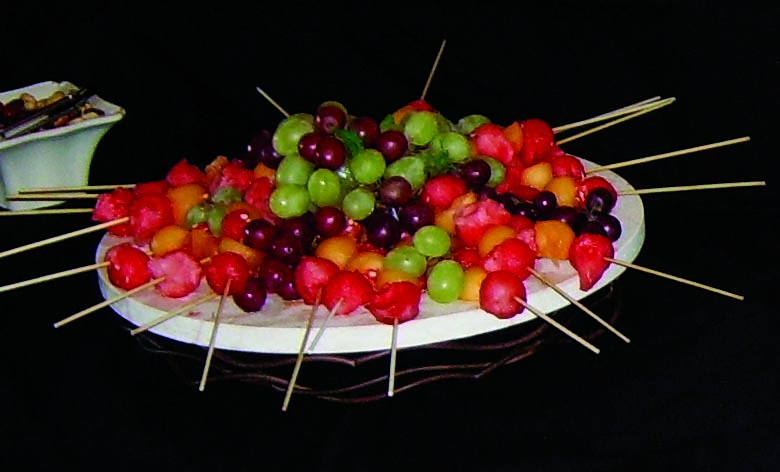 Layer the skewers on a tray and fill in the center with red and green grapes. The skewers make the fruit easy to handle, especially if you are serving all finger-foods. This is a great way of presenting summer fruit and it makes it look like you went to a lot of fuss, when really you didn’t!